In a show stopping reveal on 28th September featuring Bear Grylls, Sir Ben Ainslie and Zara Phillips MBE, the new Land Rover Discovery was unveiled to the world. Blinding Light worked with Lighting Designer Harry Tabner from creative agency Imagination to light the record-breaking launch which took place in the grounds of Packington Hall, Warwickshire. 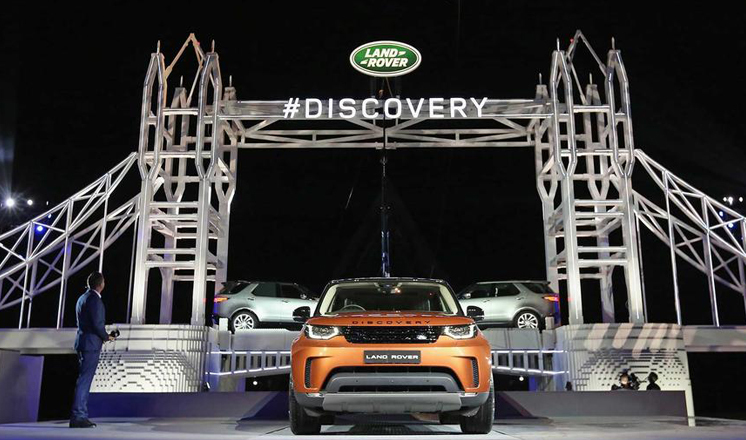 The new Land Rover Discovery showed off its unrivalled capability on a Guinness World Record-breaking LEGO structure of London’s Tower Bridge made from 5,805, 846 LEGO bricks, beating the previous world record by 470,646 pieces. Blinding Light provided equipment to light the main vehicle reveal. The rig included Martin Mac Viper Performances, RGBAW Outdoor LED Pars and Litesky Aquabeam moving lights. The reception marquee made use of Blinding Light’s increased inventory of Mac Aura XBs and Colorforce LED Battens. Over fifty battery powered wireless fixtures were used to illuminate the vast grounds of the estate and the various vehicles and exhibits spread around it. The reveal was programmed by Ben Cash and Adam Hodgson on an MA2 system comprising 1x Full Size, 2x Light and 1x Command Wing consoles which were responsible for merging and running over 70 universes of data from 12x NPU processors tied together by our Luminex Gigacore 12 data system. Crew Chief for Imagination was Ross Corbett.